A crossroads bout between two bantamweights turned out to be a compelling and thrilling fight. 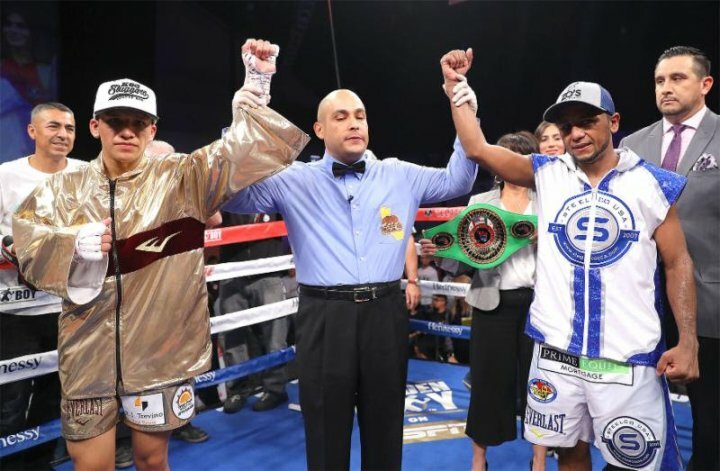 Oscar Negrete and Joshua Franco fought to a 10-round split decision draw Thursday night inside The Hangar at the OC Fair and Events Center in Costa Mesa, California. Negrete (18-1-1, 7 knockouts), who is originally from Colombia and now resides in the Los Angeles suburb of Rosemead, was the more effective fighter early. He initiated exchanges and connected first which prevented Franco from finding a rhythm. However, the momentum shifted at the midway point. Instead of looking to counter, Franco (14-1-1, 7 KOs) closed the distance and became the aggressor. This tactic worked as the San Antonio native began landing with combinations to the head which bruised the face of Negrete. Both fighters let their hands go in the 10th and final round and the near sellout crowd rose to the feet, applauding an exceptional effort. Both Negrete and Franco were exhausted at the final bell. Each fighter won the bout 96-94 on two of the scorecards, while the third judge scored the bout 95-95. Compubox numbers showed both fighters combined to throw a whopping 2,257 total punches. Negrete landed 352 of 1,111 total punches (32 percent) and Franco connecting on 351 of 1,146 total punches (31 percent). In the co-feature bout unbeaten junior welterweight prospect Daniel Zorrilla (9-0, 8 KOs) battered Dakota Linger (10-1-2, 6 KOs) of West Virginia before ending matters at 2:59 of Round 2. Zorrilla, who resides in Rio Pierdas, Puerto Rico, is co-promoted by Cotto Promotions and Golden Boy Promotions. In the opening bout of the ESPN2 telecast, junior lightweights Jousce Gonzalez (8-0-1, 8 KOs) and Ivan Delgado (12-1-2, 5 KOs) fought to a six-round majority decision draw. One judge scored the bout 58-56 for Delgado, while the other two judges scored the bout 57-57. In bantamweight action, Puerto Rico’s Carlos Caraballo (9-0, 9 KOs) stopped veteran Felipe Rivas (17-22-4, 11 KOs) at 1:47 of the sixth and final round.